Art can be very powerful. Let me rephrase that. Good art can be very powerful. Since returning to my favorite pastime midway through college, I’ve come across more than a few graphic novels which are comparable with any great art being produced today, be it in literature, music, architecture or anything else. 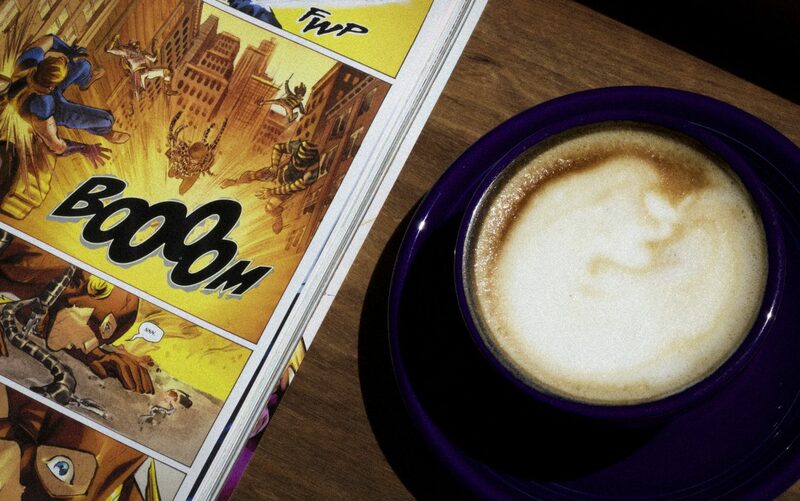 If art is meant to be an expression of something within one’s soul, which the artist then offers to the world to share with others in the hopes that it will resonate with them as well, then comic books do that just as well as anything. Some time ago Marvel Comics announced it was launching a new Ms. Marvel series with a completely different take on the title character. 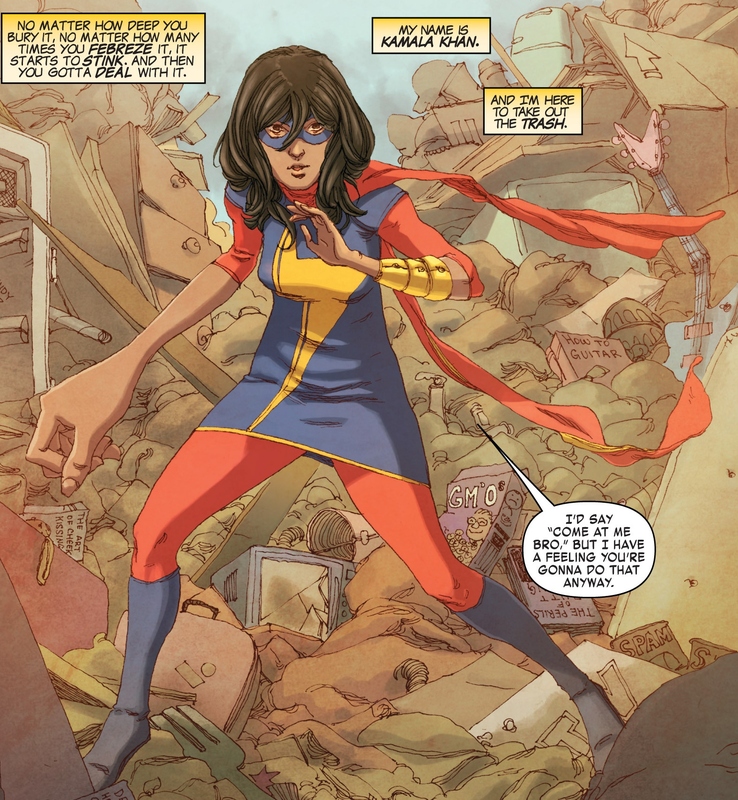 Instead of using the classic career woman Carol Danvers who premiered in the 1970s, the new Ms. Marvel is a Pakistani-American teenager from New Jersey named Kamala Khan. One doesn’t have to look too far to see that this new riff on the superheroine meets two objectives for Marvel as a company: 1) more diversity in the industry and 2) another book aimed at female fans, the fastest growing demographic of comic book readers. They seem to have succeeded at both, as Ms. Marvel’s sales (particularly digital sales) have been far more successful than anticipated, and the book now continues into its third year, not a small achievement for a superheroine-headlined book. 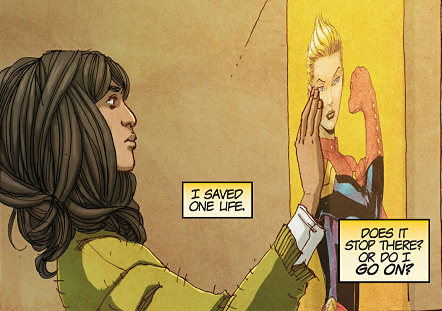 To me, this new Ms. Marvel initially seemed little more than a heavy-handed attempt at good PR. After all, anyone can create a character from a minority demographic and make them the star of a book, or so I thought. Nevertheless, out of curiosity I picked up the book’s first volume from my local library a few months ago to see what the buzz was about. Although I found Kamala’s super powers and origin story to be a bit unconventional (stretchy hands?) and I generally have a hard time getting into stories which feature teenagers, I still found the book to be well-thought out and an engaging read. Would I buy the book? Teenage characters and today’s favored style of writing are not my cup of tea, so no. Would I recommend the book? Probably not. Would I write an article about it in a faith/pop culture blog? Absolutely. Why, you ask? A few weeks ago I read a very interesting article about the author of Ms. Marvel, Gwendolyn Wilson, aka G. Willow Wilson. A self-proclaimed “genre-bender,” Wilson is originally from New Jersey and taught English in Cairo during the Mubarak regime. She converted to Islam while at Boston University, and has since married a Muslim man. She has written many books, including graphic novels, about her experience converting to Islam as well as living as a Muslim in the United States. 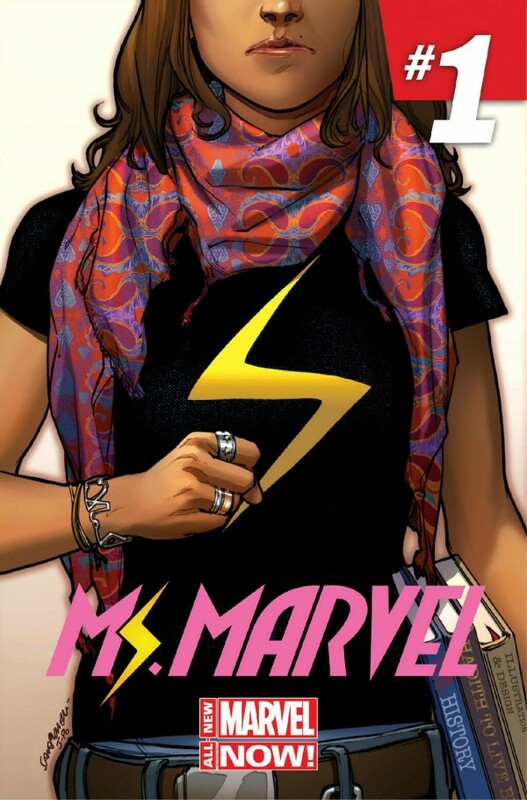 Upon reading about her life and accomplishments, I realized that Ms. Marvel was not, in fact, a gimmick churned out by a corporate entity, but a very personal work by an acclaimed writer. I have often heard said from Muslims I have known that Islam stands for peace and love, a tenet that is shared with all world religions. I believe wholeheartedly that no one would follow a religion that did not. And yet given the frequency of stories about terrorism in the world and how many involve the oft-coined term “Islamic extremists,” I admit that I personally have had a hard time believing this to be true. One hears about ISIS, terrorist camps, and dictators in Islamic countries, and one can’t help but question. “Whoever kills one person, it is as if he has killed all of mankind.” To be frank, I had no idea that such a verse existed in Islam. I’m happy to say I’ve now learned something which will inform my perceptions the next time I hear said stories in the news. Though Muslim leaders may have issued statements condemning acts of terrorism and pleading for peace in the past, as crazy as it sounds, it was from this graphic novel that this message finally reached me. 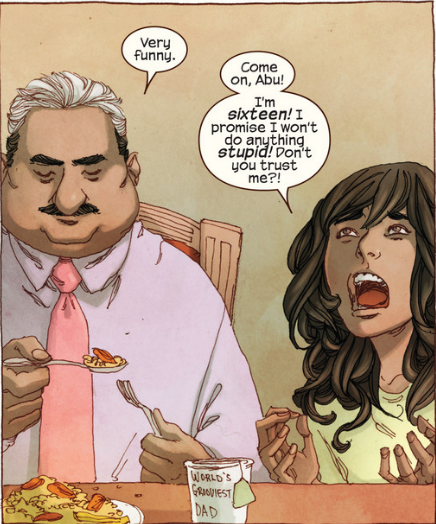 After reading Ms. Marvel Vol.1, it is far easier for me to understand that various factions do exist in the Muslim world, whereas before I had been skeptical. Had I not read this graphic novel, the chances are very slim that I would have ever encountered this verse from the Quran about the sanctity of life. I’m sure that Wilson intended to educate readers on all of the above, all while writing superhero stories in a comic book. She has succeeded. Like I said, art can be very powerful.